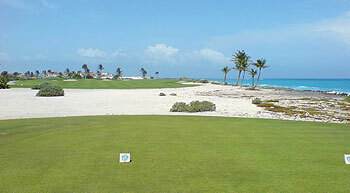 The Punta Espada 18-hole layout at Cap Cana is the first of three intended Jack Nicklaus courses at this resort. It can be played at the moment for a hefty green fee but, once the Golden Bear’s $26 million Las Iguanas course opens next door, it may become a private facility. Punta Espada debuted in 2007 and Nicklaus incorporated the natural coastal topography of cliffs, beach and lagoons into the design, routing almost half the holes on the layout along the shoreline. The par five 2nd is regarded as the toughest hole on the course and this 611-yard monster is played from one of the highest points on the property, doglegging right past a tidal lake and beach bunker. A strong set of holes around the turn starts with the shortest par four on the card at the 8th and ends with the longest par four at the 11th. A birdie might be possible at the former if the long sandy waste area adjacent to the fairway can be avoided but the chances of posting a three at the difficult 497-yard latter are very slim, even if there's a helping wind. The 250-yard 13th is considered to be the signature hole on this Signature course and it calls for a heroic, all-carry tee shot out over the Caribbean Sea to a green that clings to the edge of the island. WOW again - golf in the south east corner of Dominican is something special !! Think the ranking is just about correct ..... Teeth still oozes class although Punta Espada is on an even more stunning piece of coast and has the Nicklaus stamp all over it. Although more expensive to play (!) it is not quite the luxury of Casa de Campo ... yet, but watch this space. Teeth is still the King (in my opinion of course) but this newer pretender is going to be pushing it hard in the future as the course and the whole resort develops, established more and matures. Anyway, I plan to go back next January and compare them again !!!! I played here May 2012, after having already played at Corales. Punta Espada far exceeds the Corales layout if you are trying to pick between the two, and is a much better value. You have multiple holes on the ocean, around the ocean, and over the ocean. The tee shot on 17 looks impossible, but thanks to my caddy i placed it in the middle of the fairway. Many reviews talk about the wide fairways, but i found them to be a reasonable size, unlike Corales which are wider than a driving range. The inland holes had a lot of character also, unlike the Corales or La Cana. Waste areas, water, cliffs, elevation changes. It's definitely an A plus in my book. Jack Nicklaus has created a masterpiece at Cap Cana! I was lucky enough to play the Punta Espada course in August 2011 and it is somewhere I will always remember as one of the best courses I have ever played. I played off the Dorado (gold) tees, if you are confident about your game then I recommend that you do the same. Playing the gold means that the first and second tees are elevated way above the fairway and offer great views of the hole and coast. The 13th at 233yrds (gold) is the signature hole which is probably one of the best holes in golf however there are many holes that could be the signature hole 2,3,4,6,10,12,15,17 or 18! Holes on this course are either great or amazing! The facilities and staff at the course are of equal standing with quality of the course. Although the course may look intimidating a good choice of tees and wide fairways ensure that all can enjoy golf here. It is easy to see why many publications rank this course as the number 1 in the caribbean. 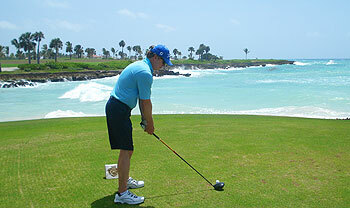 If you are travelling to the Dominican Republic ensure that you play at Punta Espada. I was lucky enough to play this great course in January 2009. It is a first class Nicklaus course with interesing options on most holes. A fantastic course, immaculately conditioned in a stunning location. I played this course over 20 times, the first one in July 2006 when they opened holes 10-18 and the last one in December 2007. The piece of land is unique and anybody could build a good course there, but you can see Jack's special touched in lots of spots, specially green 7th that when looked from this air is a perfect bear trace. Very well mantained paspalum grass and great facilities make Punta Espada a must. Some shots are unforgettable: drive on 2nd, tee shot on 4th, driver on 9th, approach on 12th, par 3 13th, tee shot on 17th and 2nd on 18th. Views of the Ocean from everywhere, this course might be the Pebble Beach of the 21st century.